I'd be broke if I lived in New York City. I mean, I'm not sure if it's possible to be more broke than I am now, but if we assume a never-ending string of negative numbers is a possibility, then New York would probably find my budget needing a bailout of Greece-like proportions. It's not even the normal living expenses like food, shelter, and homeless guy money that would do me in. It's the entertainment. Every concert tour stops in New York. Every major sports league has at least two teams in the immediate vicinity, and of course, every play is trying it's best to get a slot on Broadway. 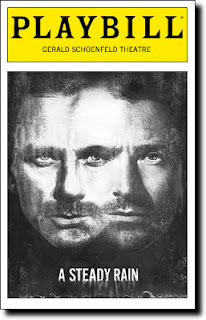 As tempting as the others are, it's the Broadway plays that would spell my doom. In my far too rare visits to New York I've managed to see a few plays, but almost everything I've seen has been a musical. 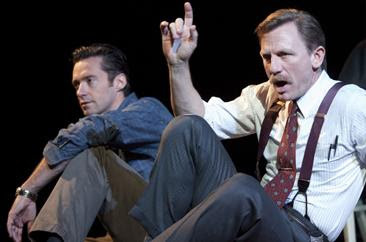 In fact, I've only seen one dramatic play on Broadway: A Steady Rain starring James Bond and Wolverine. At least that's how I remember it. Others might remember the stars as Daniel Craig and Hugh Jackman, but whichever way you look at it, it was not only my first dramatic Broadway play, but also my first star-fueled play. This added a few things to the regular routine that I was used to at Broadway shows, including scalpers trying to buy tickets outside the theatre (when they're buying singles, you know it's a popular show) and a mile long line to get in. This made little sense to me as the theatre only holds a little over a thousand people, yet I was sure at least three thousand had filed past us as we waited for the end of the line to catch up to where we were standing. Eventually we walked back about a block and joined the end of the queue, only to find still more people joining in behind us. I don't know if people were entering the theatre then going out the side door and getting in line again because it was so much fun or if there was another explanation, but apparently in New York they count things differently as they just kept letting people in. Fortunately our seats were there and waiting for us when we got in. Now during the preview performances for A Steady Rain there had been an incident where somebody in the audience had forgotten to turn off their cell phone and Hugh Jackman had stopped the play and called the person out for it. This meant that I was entering this play with the words "Quiet as a church mouse" solidly ingrained as my mantra for the evening. I triple checked that my phone was actually powered off, then took my seat, right beside a man with one of the worst coughs I've ever heard. Now there's not much you can do about a cough, and he was trying hard to muffle it, so I just hoped for the best, but for some reason this gentleman decided that the dimming of the lights was his cue to start unwrapping cough candies. Once the initial applause for the actors died down, the only noise you could hear in the theatre was the crinkling of Halls being unwrapped. I wanted to lean over to him and whisper "Dude, did you not see the video? Don't piss off Wolverine!" but I decided to just lean in the other direction towards my wife. If Wolverine did come up to deal with the serial candy cougher, I was going to have a prime seat. As a non-musical, A Steady Rain was certainly different from what I was used to. The entire show consisted of the two actors and two chairs. That's it. I'm assuming the rest of the ultra-high ticket price went to paying the two superstars twelve weeks worth of wages, which seems fair when you think about it. While I've had some dramatic plays catch my eye before, none of them ever appealed to me enough to sacrifice an evening in New York (or half my salary) to check them out. If the casting of two mega-stars meant sold out shows for the entire twelve weeks, then the actors deserved to get paid. 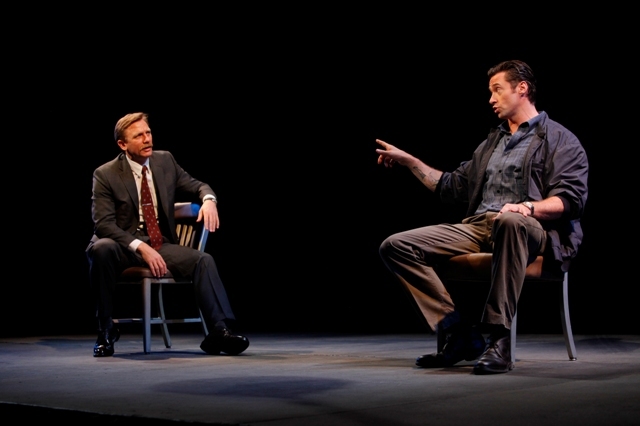 Truthfully though, I might even have passed on this one if it weren't for Lori's adoration of Hugh Jackman, but I'm glad we didn't as it really was a well acted play. I mean once you got past the whole idea that claws were going to shoot out of Hugh Jackman's hands at any moment. Block that idea out and the rest of the evening was superb. As we left the theatre we discovered that half of New York had decided to come and greet us. Well, they might have been there to try and catch a glimpse of Daniel and Hugh, who apparently had to run the gauntlet on the main street in front of the theatre in order to leave. I love the fact that there was no back door for them to sneak out, although it doesn't exactly inspire confidence in the fire safety of the building. I really wanted to wait around and see what Daniel Craig drove off in (It had to be an Aston Martin right?) but the night was still young and there was plenty to see. Of course they would have to be free things, as New York had managed to leave me broke after only the first day. I definitely could never afford to live here.